» Our New Baby Is Here! Everything was going smoothly until that last blood test… Then suddenly everything was a rush. A nurse called me to tell me there were anti-bodies in my blood that might mean distress for the baby. My doctor wanted me to be up at the big hospital, about an hour and a half away, at 8 am the following morning to meet with the high-risk team there. The nurse couldn’t really tell me more than that, and promised that when we met with the new doctors tomorrow, they’d be able to explain everything much better. A few minutes later, they called back and asked me to get to the local hospital as soon as possible so they could check on the baby. I laid there for an hour listening to the reassuring sounds of his little heart, whoosh-whoosh-whooshing. Everything looked great still. I went home feeling pretty confident that whatever the high-risk folks had to say, it would probably end up being a lot of worry over nothing. Still, I didn’t sleep well that night. Brand new James. Not even 12 hours old here. He slept and slept and slept the first two days. As luck would have it, my dear sister was at my house when we got back from listening to the baby. Her plan had been to stop over with us on her way home from visiting our parents. I’m so glad that our home is a perfect stopping place on that trip! 🙂 She stayed the following day to watch our big kids while we got up bright and early to head all the way up to meet the new doctors. They took us in right away for an ultrasound and then we waited while the doctor looked over all our information and history. She came in and explained what the issue seemed to be and why we were suddenly referred to her team. 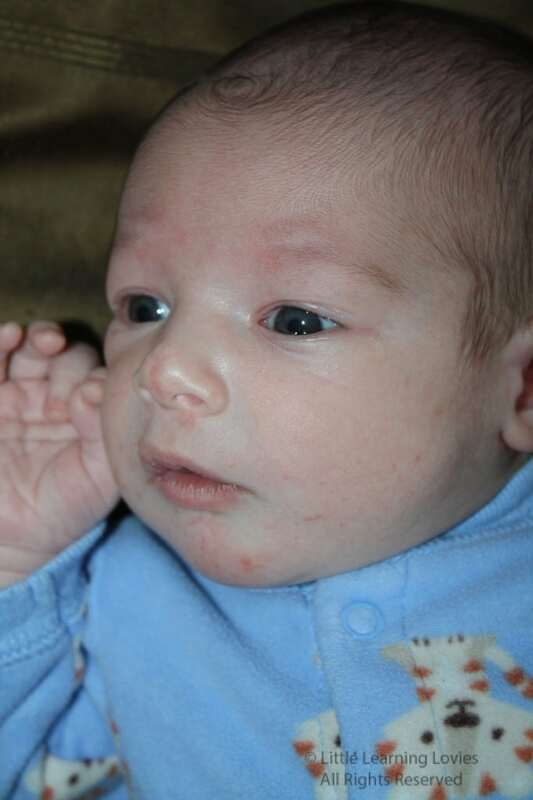 The antibodies they found in my blood could indicated that my body was attacking the baby. Most of what she saw, though, seemed to indicate that there was no issue. Except for one thing… there was a shadow around our little ones liver that could be a pocket of fluid. After about 20 minutes of calmly talking us through everything, and leading me to believe that we would be heading home shortly and coming back on our scheduled day the following week for our c-section, she told us that she’d feel a whole lot better if we didn’t wait, because even if everything was okay this minute, it could turn bad overnight. James in my husbands arms. 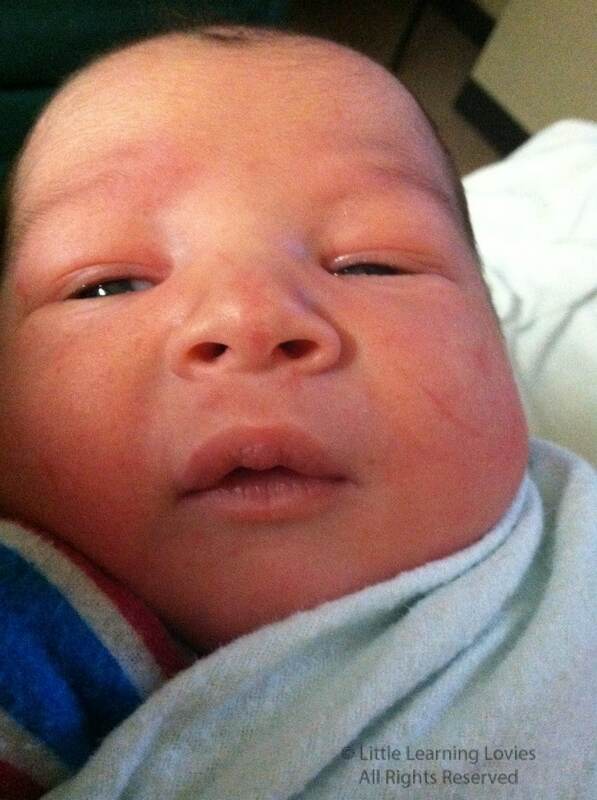 Even though he was born a pretty big baby at 9 lbs 10 oz, look how tiny he is! Babies are amazing! Suddenly, we were being admitted to this hospital, under the care of doctors and nurses we had never met. It was a whirlwind of names and faces and questions and monitors and blood tests and more questions. Everyone was very sweet, helpful and encouraging. The doctor who was going to do our c-section wanted to make sure they had blood in-house for both the baby and I just in case. So she ordered that up and told us that we’d head into surgery as soon as that arrived. We prepped. And we waited. It would arrive by about 3:00 pm, we were told first. And then three came and went with no word. At about 4:30, the doctor came in again and told us what the hold up was. The blood was finally prepped for us and on it’s way. From Richmond. It takes about 3 hours without traffic to drive from Richmond to the hospital. So she made the call that we’d schedule for first thing in the morning, allowing me to eat something and sleep. I was up at 5:00 the next morning. My darling had fallen asleep on the pull-out couch next to my bed. I watched as the sky slowly turned pink, then orange, then yellow. The nurse came to prep me before it turned blue. My husband woke and we both prepared ourselves. It seemed to take forever for that clock to tick it’s way to 6:30, but then suddenly it was time to walk to the OR. This wasn’t my first c-section. In fact it was my fourth. But it almost felt like my first one. My heart was racing. Even though I knew what to expect, I was in a new place, surrounded by new faces, and a million ways this could all go horribly wrong kept racing through my mind. It’s a terribly difficult thing to allow someone to completely immobilize you, to place yourself entirely at the mercy of a room full of strangers. Once the anesthesiologist was finished doing an amazing job and they had me situated on the table how they needed me, my dear, sweet husband came in and I was immediately far more relaxed. I could let the strangers do what they needed to do while I stared at my husband, and we waited to hear that first cry. Would everything be okay? I was so focused on my husband that it was a bit of a shock when the dear anesthesiologist leaned to to let me know that it was just about ‘baby time’. 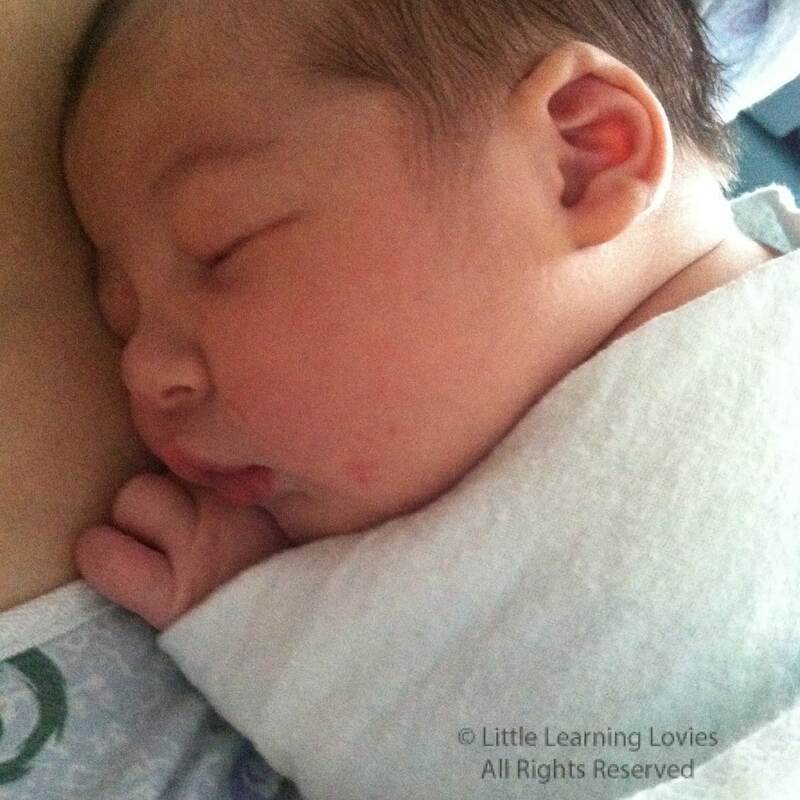 I heard the doctor exclaim as she saw how big our new little boy was. Where was his cry? It seemed to take minutes before I heard anything, though I’m pretty sure it was really only a few seconds. And then finally… I heard his little voice. Was he okay? I waited for someone to say that they were taking him to the NICU. I strained to hear if there were hurried, hushed voices. I couldn’t make anything out except his own clear, loud little cry as they wiped him down and wrapped him up. A few moments later, and he was in my husbands arms right where I could touch his sweet little cheeks and kiss his little face. I thanked God in those moments with every touch and every tear as I realized that he was okay. The doctors and nurses, the anesthesiologist and pediatrician, all of them were smiling and happy as they finished their work. He was healthy with no signs of the distresses we feared. Nine pounds, ten ounces, they kept exclaiming. And healthy as could be. Later, in recovery, without my asking, they made sure they got him skin-to-skin with me. 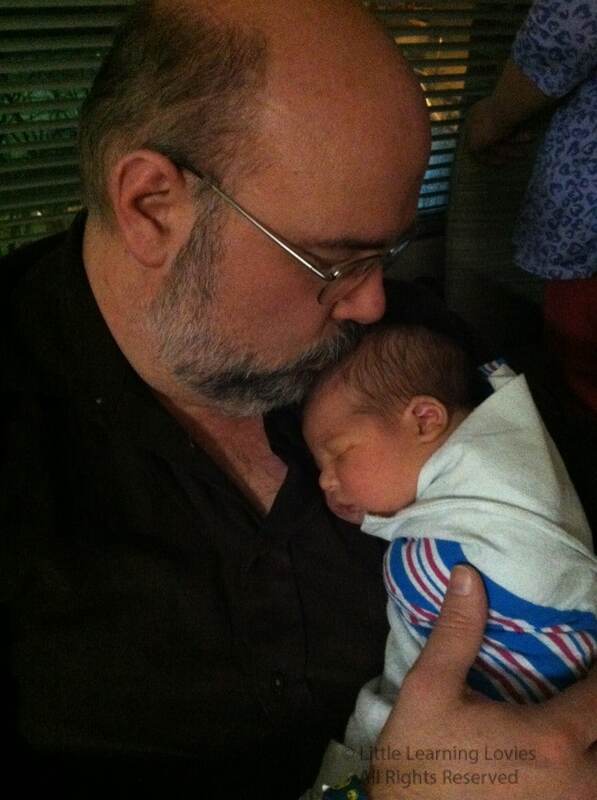 Long before I could feel my legs again, I was holding our new baby. The pediatrician came in and asked if he could check on him one more time. He took him barely a foot away and quickly checked his breathing as he exclaimed with true joy how great he was doing, how wonderful his color was. He completed his exam as swiftly as he could and got that baby back with me right away. They got me into a room where I would spend the next three days. Two and a half of those days were spent trying to convince this new little life that he really needed to eat. Not once did a nurse try to pressure me into using formula. Not once did they complain to me that I had fallen asleep with him in my bed. In fact, he didn’t leave my arms for more than a few minutes at a time when they did things like his hearing test. Not once did they try to give him anything or take his blood without first asking me. And eventually, after much worrying and fretting on my end, he figured out how to latch on, decided he was hungry enough, and he nursed for a good half hour. Just as he finished that first feeding, my nurse came in, took a look at how I was laying with him and, I’m sure, the calm smile on my face and her own face lit up. “Did he?” she said hopefully. “Yes!” I squeaked back at her. She turned on her heal and popped back out of the room. I heard her exclaim down the hall “He did it! He finally ate!” and within a couple of minutes, a small parade of nurses came in to celebrate our long-awaited success. We’ve been home now for two weeks. We’re starting to find our rhythm again with this new family member. We’ve done very little other than snuggle him and each other and wait for things to settle down again. And as with all of our other children, I am amazed at how quickly someone so new can feel as though they’ve been here forever. What did we do before this little guy came into our lives? How had we not noticed that big gaping hole in our family that was suddenly filled with him? I am so grateful for this sweet little gift from God who loves nothing more than to be held and loved. Welcome to our family, James! Two weeks old and much more awake now. His slate-blue eyes are incredibly curious. Congrats! He’s beautiful. I’m so happy for you! He is beautiful! All three of mine have been c-sections as well (breech). We are unfortunately done, as my doctor strongly advised against more for me, but they are each a wonderful blessing. And your site is great for helping me learn to homeschool my 5,3 and 5 month old. Congratulations! He is absolutely gorgeous! As mother of five, I can say with certainty that C-sections are indeed nerve-racking! 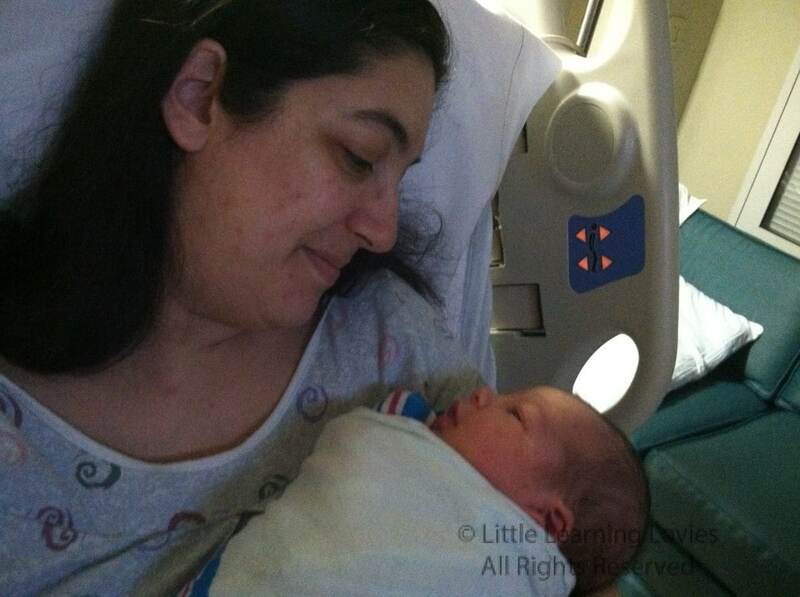 My last child came via c-section and I was petrified! At 9 lbs and 8 oz., I can say I was happy she arrived that way, but she never was going to be ‘average’. I had surgery to *hopefully* end our contribution to the population after our fourth child was born… But our mighty Lord seen fit to bless our family with our July 2nd “Firecracker” some six and half years later! And I wouldn’t trade any of them for all the riches in the world! Again, congratulations on your newest addition! Congrats!!! I had a VERY scary 4th pregnancy and c-section. All is good now…it’s still hard to talk about and he is almost 6 months old! 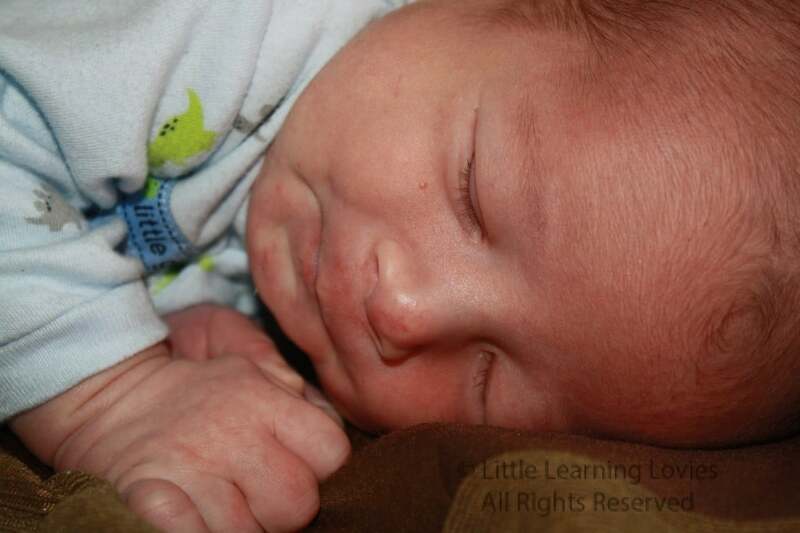 Your sweet little James is absolutely adorable and I am so happy all is well! God is good!!! I’m so glad you finally got around to sharing your story! I love you. Congratulations! Thank you for sharing your story. He is beautiful. Congratulations. I am so glad everything is OK and you and your baby are home resting and recovering now! Although I was blessed to have my first three children through natural, home birth, this pregnancy is not going to go that route. I have already been to the hospital twice for threatened preterm labor and we still have 10 weeks to go. It is hard and scary when things don’t go as they should, but God really has a way of working things out for the best. Congratulations to you and your family on the birth of your son, James.